These items have been loaned to us by Castle Point Council and for many years they were displayed on the council office walls. 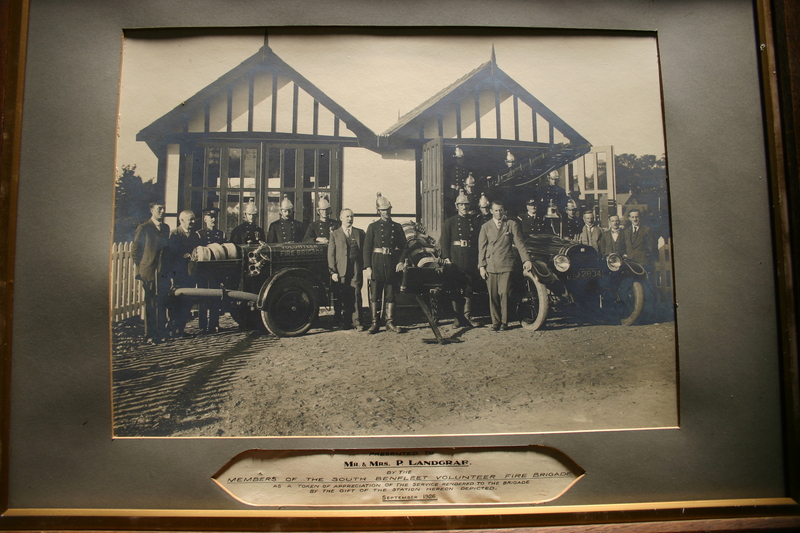 The photo was presented to Mr & Mrs P Landgraf by members of the South Benfleet Volunteer Fire Brigade (see also) in September 1926 as a thank you for the gift of the fire station. The beautifully illustrated document written in calligraphy is from Members of the Parish Council, South Benfleet. 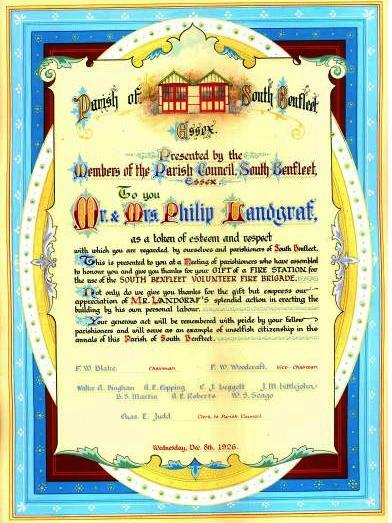 This document was presented to Mr & Mrs Landgraf as a ‘token of esteem and respect’. 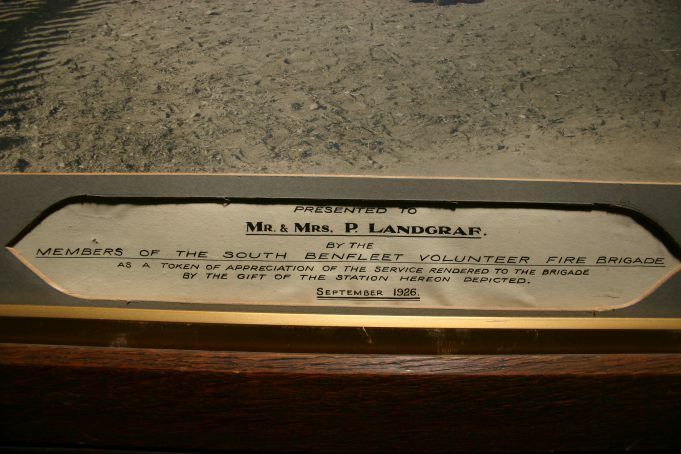 From other photos loaned to us by Castle Point Council, we can see that Mr P Landgraf (see also) was a member of Benfleet Urban District Council 1929 – 1930. Can anyone help us with the names of any of the brigade members or council officials? Philip and Maria Landgraf were my Great Grandparents, any further information on them would be greatly appreciated. 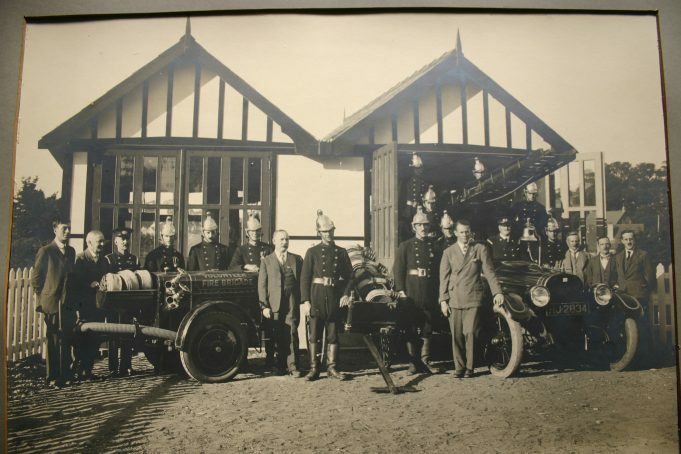 I am positive that my late grandfather Benjamin Mark Rossiter was part of the Benfleet volunteer fire service, probably between the years of 1918 and possibly the late 1920s. He died from the dreaded Consumption in 1931 leaving his wife and four children to fend for themselves. Benjamin came to Benfleet from South London having completed an apprenticeship in Carpentry, and apart from working on High Street Banks in the city and aviation companies in the London area he set up his own business in Benfleet before the housing booms and the Great war, probably 1914 onwards..
After all these years I would love to see him credited not only as a volunteer but it was also stated by my late grandmother and my own father that he contributed in building the first Fire cart for Benfleet.